You are what you drive. OK, maybe not, but as you look back on the cars you’ve owned, what does that say about your life? For some people, their car is just about transportation — a means to an end. Maybe it’s just the Californian (or as Ahhnold says: Kaleefornian) in me, but I think your car tells the world about who you think you are and what’s important to you at different stages of your life. Imagine who you were in college: would that person drive in a mini-van? Remember searching under the seats to find change to buy gas when you were in high school? Try to do that and fill up your SUV. With that in mind, Here’s a quick run-down of the cars in my life. Remember, life is too short to drive a boring car. 1974 Alfa Romeo GTV 2000. “Old Reliable” (aka “Ollie”) was sold in November 2003 after almost 20 years of faithful service. The first car I sold on eBay. And the buyer eventually restored it too. 1982 Alfa Romeo GTV 2L (Euro). Rust Bucket Wagon. Second car I bought in Germany. Being the California kid I am, I didn’t do the math: Italian car + German winters = rust in the Spring. You could literally see this car rotting before your eyes. I do have many fond memories of this car: spinning out every time it snowed; losing a muffler on the Autobahn; losing a rubber bumper strip on the Autobahn; blowing a piston head on the Autobahn (the remains of which is now a paperweight in my office). This was the car that convinced me to start buying new cars. 1989 Volkswagon Jetta. The Jetski. Honest reliable transportation. Bought in Germany. I put 60,000 care-free Autobahn miles on this one. This car took us to Berlin the week the wall fell. The two events are not directly related. If I could have had air conditioning installed in Texas in ’92, I’d still have it today. Oh, and it hated my wife. Maybe not. Go figure. 1992 Honda Accord. What can you say about an Accord? Simply dependable and well built– they just don’t have a soul. This was an excellent car for surviving a New England winter, it just never became part of the family. 1992 Volvo 245. “Helga” Helga had one advantage the previous cars didn’t have: my wife selected her. Helga was an excellent choice as a “dog-wagon”– the beagles loved riding in the back. Helga was getting up in miles so we decided to trade her in on a new Volvo wagon before we made the drive West. We will always have fond memories of Helga and the faithful service she provided. 1989 300e “Hans-Otto.” I had a real love-hate relationship with this car: My mechanic loved it; I hated it. Having spent a year of my life in Stuttgart, I’ve always had a special place in my heart for Mercedes cars, and in this case I definitely let my heart overrule my head. I had this car for about 18 months, spent over $5,000 in repairs (about the same amount was made under the warranty,) and decided to cut my losses. 1997 Ford Ranger (aka Ranger Bob). Ever since I hauled 1,600 lbs. of concrete in Helga while building a deck off the back of our old house, Pamela has been telling me I needed a truck. The Ranger proved to be the most reliable vehicle I’ve ever owned. After six years and 92,000 miles I sold it to make room for the new MINI. I think during the entire time we owned Ranger Bob I spent a grand total of $200 on non-routine maintenance. I give Ford a lot of grief for the quality of cars they produce, but you certainly cannot knock Ford trucks. It was nice for trips to Home Depot, but the 18 MPG fuel consumption was getting expensive. Bye Bob. 2000 Volvo New V-70. Volvo got in hot-water with the State of California when they sold us a new car which wasn’t certified for sale in the Golden State. It took them almost a year to figure out what they were going to do about it. At one point, we offered to turn in our old car and walk away, but they were determined to get us in a new car. First it was to be a 1999 model, but they took so long to make their decision that they were all gone. Finally it was to be a 2000 model, but when they looked at the inventory all that was left were the fully-loaded models. So, painful as it was, we turned in our base model Agatha for a top of the line, leather-clad, sunroof sporting new car (at no additional cost to us.) Twist my arm, go ahead… We had this car for 11 trouble-free years and sold it in the Summer of 2010. 2004 Mini Cooper S. In the spirit of less-is-more, we’ve gone traded two for one. Gone are the truck and Alfa. 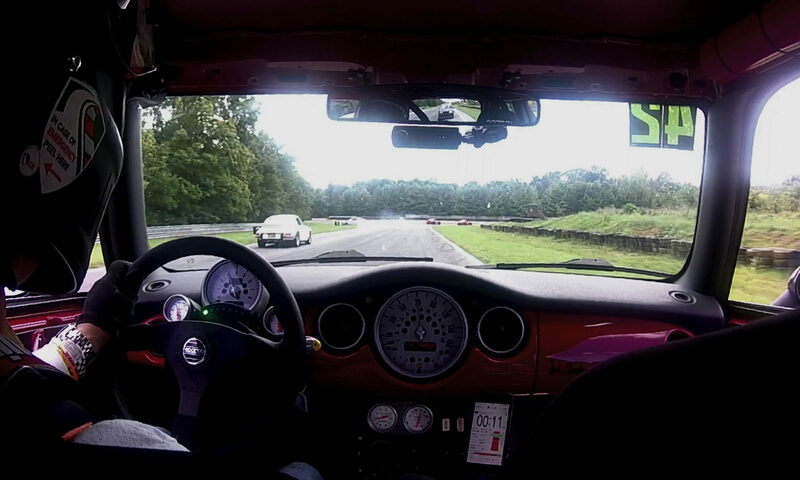 And in their place, we now have a brand new 2004 MINI Cooper S. Better performance, better gas mileage, more smiles to the mile too. This little car has traction and stability control, dual sun roof, leather, and a roots-type supercharger. 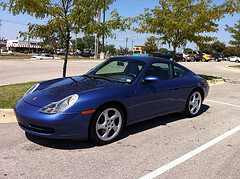 As Tim Allen would say, “Ho, ho, ho ho.” Sold in June 2012 after 150,000 happy motoring miles. 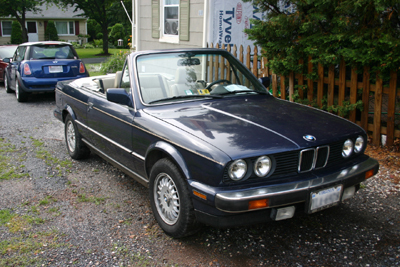 1987 BMW 325i Convertible. It’s one of those conversations that I’m sure every husband can appreciate. One day, wife says, “I’d like to have a convertible some day, but it needs to have 4 seats…” There it is: license to shop. With a birthday just around the corner, it was the perfect time to buy her a convertible. She gets to drive around in the wind and sun, you get to tinker with another car. Win-win. Sold it in the Spring of 2011 for a little bit more than we paid for it. 1989 BMW 325is. 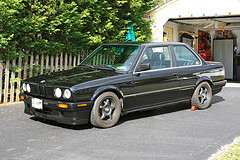 The latest new old car has been the BMW E30 track car project started in the summer of 2008. The initial plan seemed rational at the time: as GeorgeCo was spending more and more time on the track, it made sense to get a dedicated (read: disposable) track car. The logic was sound, but the chosen car was not. Three years and many, many parts later, the project is complete. It’s been fun, but if we were to do it all again, we would have started with a better car. Sold in the Fall of 2011. 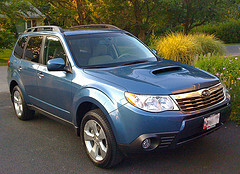 2010 Subaru Forester. We didn’t set out to buy this car. 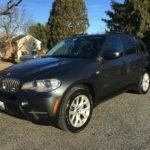 We were going to test drive the BMW X3 and Mercedes GLK. We thought we should set a baseline so we selected the Forester to which we were going to compare the other two cars. The salesman made the mistake of handing GeorgeCo the keys in an empty parking lot and telling him to hammer it and see what it could do. After several happy drifting circles and an ashen-white salesman, GeorgeCo knew this was the car to get. Sold in the summer of 2018. 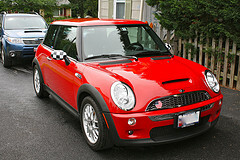 2011 MINI Cooper S. Yes another MINI. 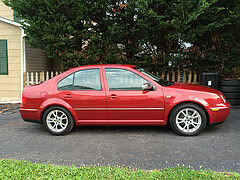 This is a beautiful, low-mileage, used car that GeorgeCo just couldn’t resist. No more bone-jarring commutes. No more 100 db interior noise. No more lost fillings on potholes. Motoring bliss. Update, June 2012: That bit about not becoming a trackrat? Forget about it… This is now a full-blown trackrat. 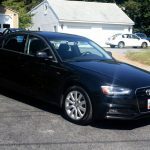 2015 Audi A4. Since we had to replace the Jetta, we figured the best bet was to get my wife a new car and give the Subi to our daughter. 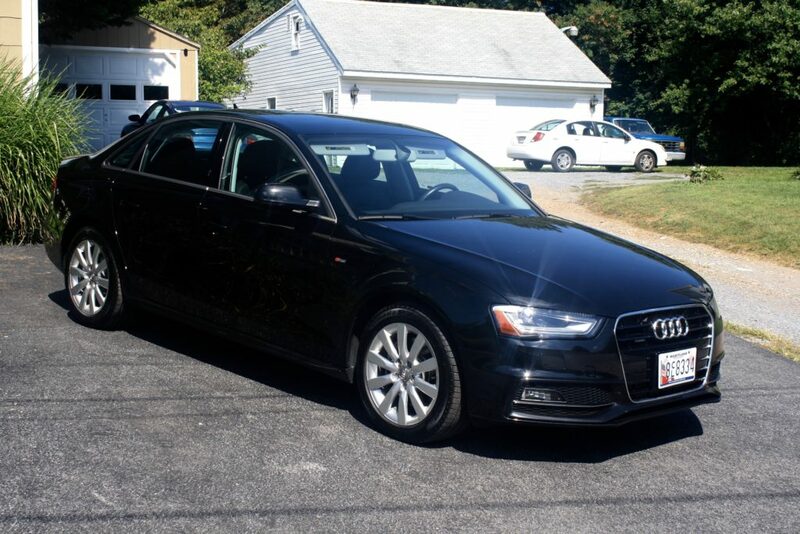 This is a gorgeous, black A4 Quattro. It is a CPO car which means it has 3 years left on the factory warranty, plus 2 more after that. Heated, leather seats, and Nav. That plus Quattro is all we wanted. 2013 BMW X5. 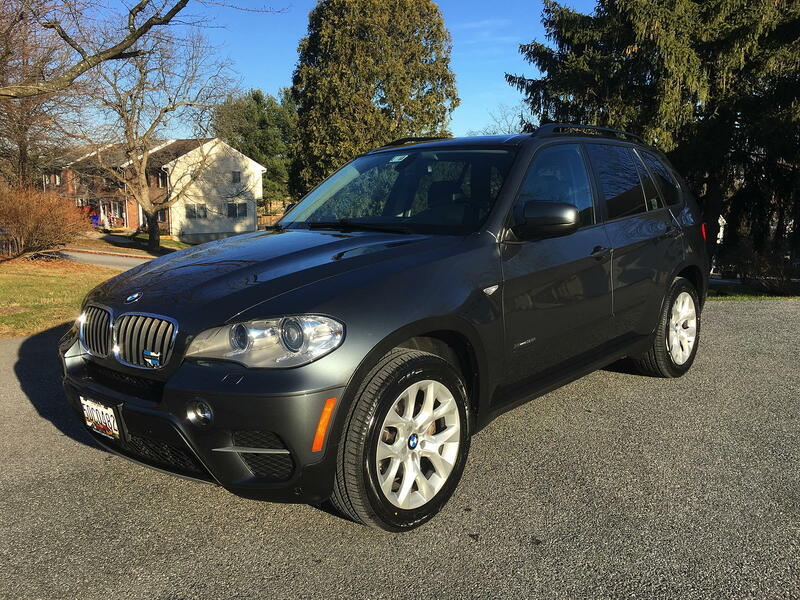 We picked up this used X5 in October 2017 to use as a tow vehicle. It was only 5 years old, but had over 100k miles and lots of issues. The good news it that we picked it up at a significant discount. Let’s see if it turns out to be bargain once we get everything sorted. It rides very well for being a mid-sized SUV and certainly has a level of luxury we aren’t used to having. 2009 BMW 328i. Sold the Forester and picked up a neglected 328i for a decent price. The dealer didn’t realize the car had sport seats, sports suspension, and paddle shifters, so I didn’t tell them either. It took a few weekends to sort out the paint and clean the interior, but we’ve already had it to the track and it’s mechanically solid.